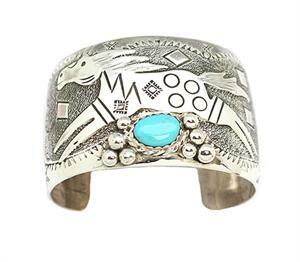 This wide stamped sterling silver bracelet has a running horse on it with a free form turquoise stone and silver drops. It measures approximately 1 5/8" wide and is handmade by Navajo artisan Virgil Reeder. Currently only this one available.